Square-cochleate design. Some of them form one combination pattern. It also is known as a Chinese traditional motif. “Kaminari” without trueno is called “Inazuma”, and expressed by jagged lines as shown below (“kaminari 2”). In traditional folk beliefs about gods, the God of the Thunder has been called “Raijin”. Raijin has a red ogreish face and hands with three fingers, which indicate the past, the present and the future, and tabrets on his back and drumsticks. 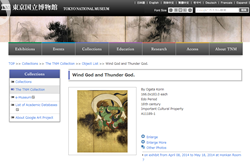 Usually, Raijin couples with “Fujin”, the God of the Wind. As Fujin controls the wind, he has a big bag from which the fierce wind blows. Fujin has four-fingers hands and each finger indicates all four points i.e. north, south, east and west. Both of them put on a cloth on their shoulder, and fly on clouds. And they have two-toes foot, which is said that each toe indicates the sphere and the earth.